Have you ever wondered what it would be like to take a spa vacation in a Czech spa town? 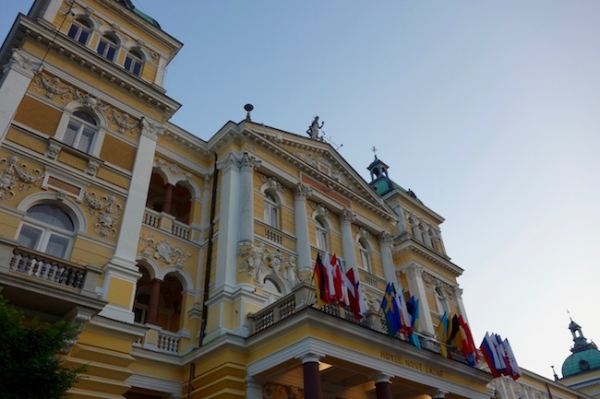 I did a week-long spa package at the historic Hotel Nove Lazne, and found that there’s no better way to learn about European spa culture, improve your health and eliminate stress. 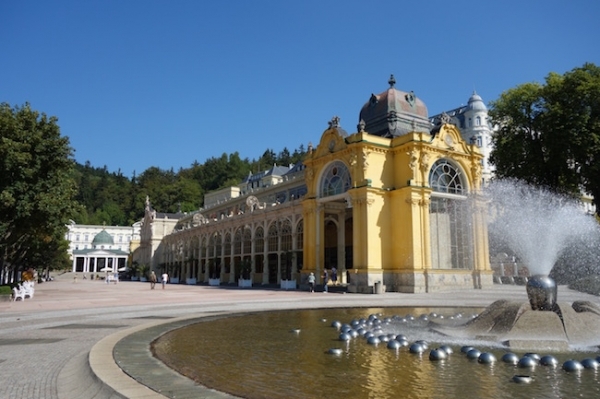 I’m passing on what I learned to you, so here it is: The easy way to spa at Marianske Lazne (Marienbad), Czech Republic. Crack! I hit my head on the top of the van as I’m climbing in, tumble back and end up sitting on the sidewalk. I get up and reel around for a moment, wondering if I’ve done some permanent damage. It’s not like I have any brain cells to waste. The young Czech driver insists on accompanying me to the reception desk at the Nove Lazne Hotelwhere I’m checking in, and explaining to the front desk clerk what happened. I don’t understand Czech, but I appreciate the staff members clucking around me maternally. 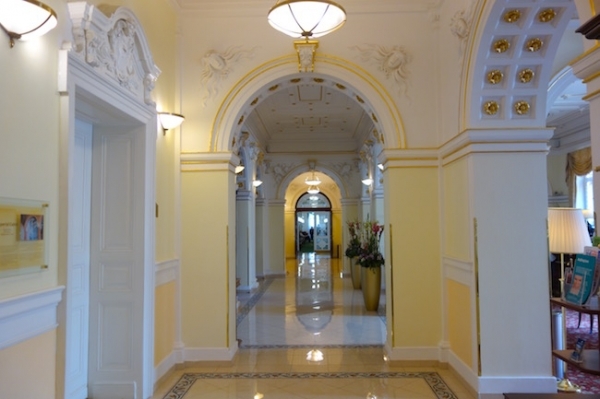 Luckily, since I have an appointment with the hotel’s spa doctor anyway, within five minutes I’m having my head checked out in a beautiful historic hotel in the Czech spa town of Marianske Lazne, also known as Marienbad. 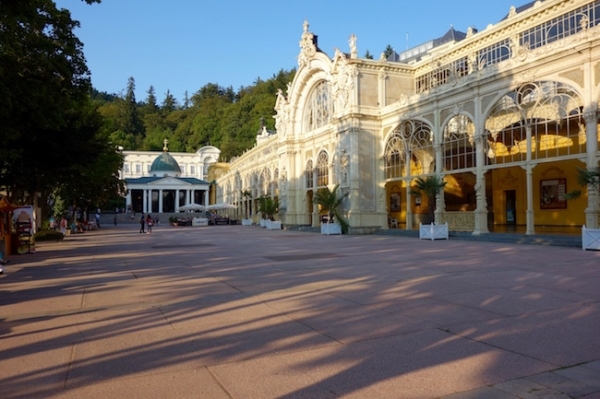 Located in the Bohemian region of the Czech Republic, near the German border, Marianske Lazne was once one of the most glamorous spa towns in the world, patronized by the rich and aristocratic. Today, while those same grand buildings have been updated, the focus is still on the traditional spa cures based on the town’s abundant mineral-rich springs and natural CO2. Fortunately my head is fine, and I can get to the important business of planning my spa week. I’ve signed up for a week’s spa package at the Hotel Nove Lazne, and seeing the spa doctor helps to customize your treatment schedule. My main problem is narrowing down all my ailments to decide what to focus on. Aside from an apparent inability to enter a van correctly, I’m perilously close to burnout (thank you very much, social media! ), have a bit of stomach indigestion and, let’s see, sore feet. I also tend to get sore throats in the winter and, as I know the curative waters of Marianske Lazne can be good for respiratory problems, I’d like to engage in some preventative medicine tactics. I am, if I may say so humbly, pretty adventurous when it comes to extreme spa treatments (unlike extreme sports), and I know that natural CO2 injected just under the skin is said to alleviate joint pain. 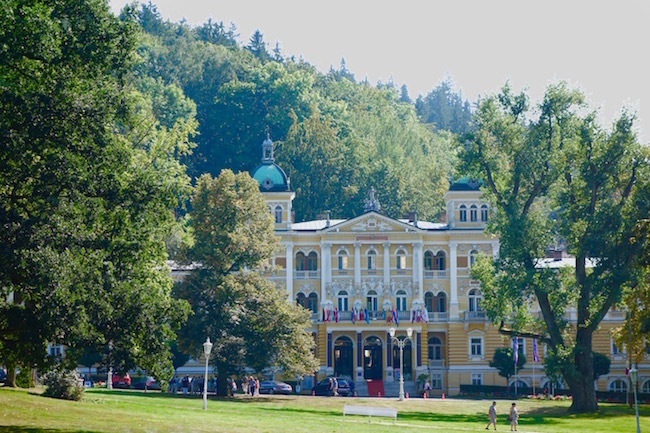 Marianske Lazne is famous for their CO2 gas that emerges from the Maria Spring. I actually tried injections once before in the Czech spa town of Frantiskovy Lazne, but it was years ago and all I remember are all the German women in the waiting area laughing at my fear and swearing that the injections reduce back pain. After seeing the doctor I flop on my back on my bronze-and-golden bedspread and think how lucky I am to be staying here. Reconstructed in 1896 from an older building that dates back to 1812, Nove Lazne is one of the most prominent landmarks in Marienbad. This just makes the fact that I’m sleeping in a bathroom so much sweeter. Let me explain. Nove Lazne, which means New Spawasn’t built as a hotel but as a bath house. The rooms weren’t hotel rooms they were bathing cabins. From the looks of my high ceilinged room, it’s clear that it is actually two bathing cabins put together, and it’s grand as can be with a Bohemian crystal chandelier and decor of pale gold. 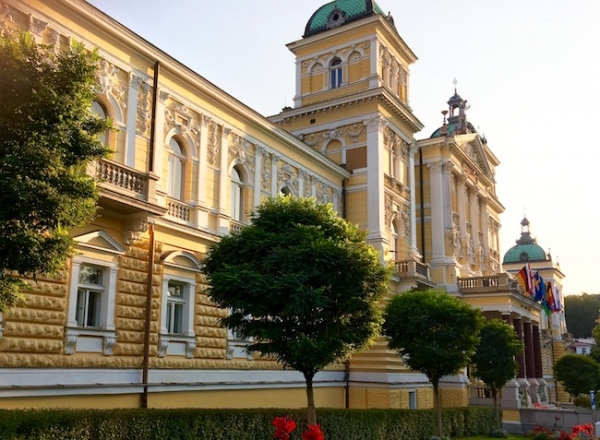 The exterior of the Nove Lazne Hotel is even grander, a yellow neo-Baroque beauty with white pillars, statues, domes and an overall ambience of elegance and grace, but which somehow also reminds me of a delicately melting ice cream cone. In fact, a lot of the town makes me think of ice cream and cake (although that could just be because of all the desserts offered every night at the hotel buffet). Today, the Hotel Nove Lazne is owned by the Danubius Hotels Group, the largest spa hotel company in Central and Eastern Europe. They have quite a hold on the curative spa vacation market in Marianske Lazne, and in this case it works in your favour. For example, if you stay in their complex of five interlinked historical hotels you can use the pool and sauna facilities at either the Aqua Wellness Centre at the Hotel Hvezda or the Roman Baths at the Hotel Nove Lazne. 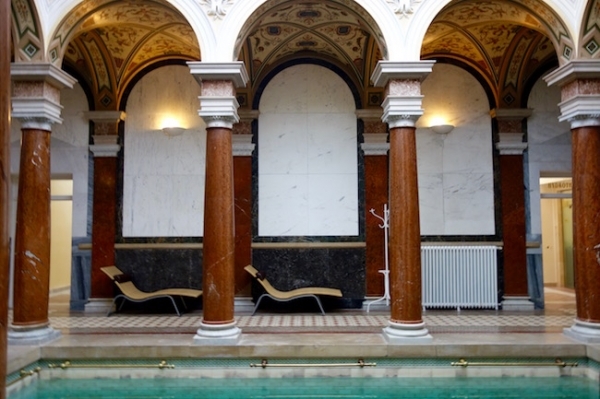 And believe me, one of the absolute highlights of staying in Marianske Lazne is lounging around in Nove Lazne’s Roman Baths. Originally part of the men’s steam room, the Roman Baths built in 1896, stand virtually unchanged. 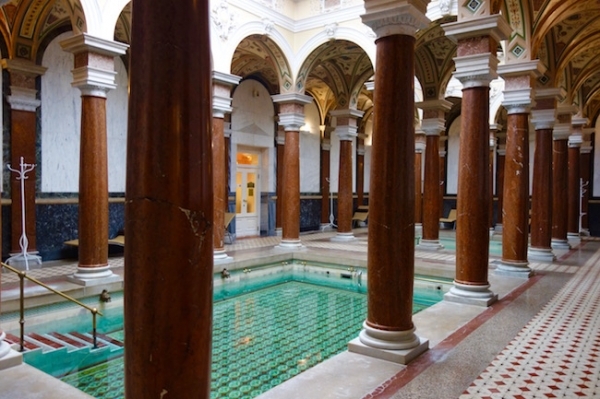 Their design was inspired by Roman bath houses in Vienna and Hungary, and it does remind me of a smaller more tranquil version of Budapest’s Gellert Baths. Two richly-tiled pools are surrounded by columns of red Salzburg marble, the richly-painted arches overhead practically transforming a swim into a religious experience. Much more to my liking are gas baths. 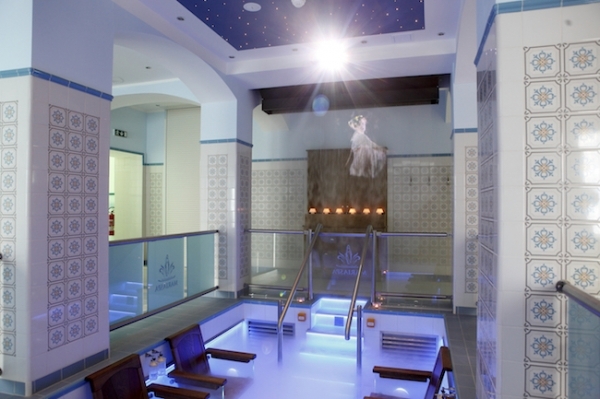 At the spa in the Nove Lazne Hotel, this entails lying on a treatment bed in a bag that reaches up to your chest, which is then filled with the Maria Spring C02. While sceptics will scoff, it’s said to improve blood circulation and, by saturating the haemoglobin with oxygen, help regenerate cells for an anti-aging effect. In the name of curiosity I try a different type of gas bath over at the Danubius-owned Maria Spa in the Hotel Centralni. Here it’s a more of a multimedia experience combining oxygen inhalations, film, sound and special effects. It may be a treatment that dates back to 1905, but it’s an updated take on an old tradition. A traditional spa cure isn’t a true cure without gentle exercise, so each afternoon I roam the wooded trails that surround the town, stroll through the landscaped parks or wander up and down the colonnades, my porcelain drinking cup in hand. Does it sound boring to you? For me it’s renewing – the most gentle way of amusing myself, getting healthy and reducing stress I can imagine. As my week’s spa vacation comes to an end, I wish I hadn’t booked just one week, but two. 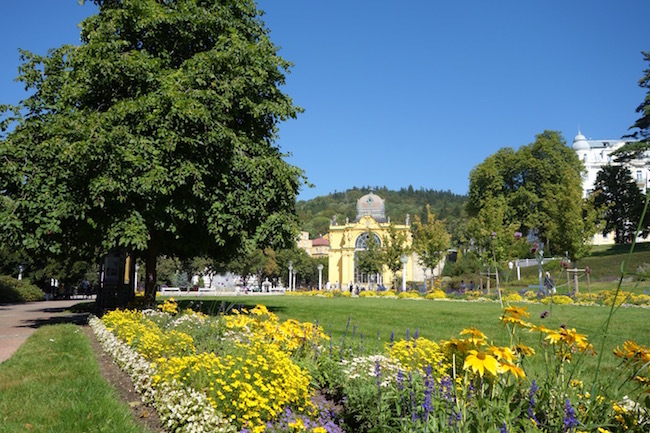 I’ve fallen hard for Marianske Lazne – and not just on the sidewalk getting into of the van, but deep in my spa-loving heart. Treatments are both shorter and more clinical than spa therapies back home. A massage might be 20 minutes, and it’s about the same for a mineral-water bath. So if you see you have 4 treatments a day, don’t panic and think you’ll be on spa overload. Prepare to strip. If you’re going to make the best out of a curative spa vacation, you’ll need to (try) to get over the shock of having to clamber up onto spa beds or get into the shower buck naked – there just isn’t the same attention to um, delicacy, here. Don’t expect dimly-lit treatments rooms, four kinds of herbal tea and New Age music. Who needs it when you have mineral water! If you really want to get aristocratic you can book a warm mineral bath in Nove Lazne’s Royal Cabin, which was built for King Edward VII himself. It’s a Fabegre Egg of a bathing suite complete with hand painted tiles, an original tub and an attendant to answer your every beck and call – or at least to run your bath. There is an extra charge for this and you should book early because it’s very very popular. Leisure facilities are extensive at the Hotel Nove Lazne. On either side of the Roman Baths is amodern sauna room, one where bathing suits are required and one where they’re forbidden, and I only got in trouble once for going into the clothing-free sauna with my bathing suit on. That’s because the bathing-suit-free side has an irresistible cold plunge pool that’s such an icy shock after the sauna you feel as if you’ve just eaten your own heart. And then you feel wonderful. There is also a third pool in a different room, with water jets. This is also where you’ll find the hot tub. Usually with your spa package you get your meals. People often choose half board, meaning breakfast and dinner, both of which are buffet. Individual dietary needs can be accommodated, such as gluten free or low calorie. This varies greatly depending on where you stay, what season and what package you choose. 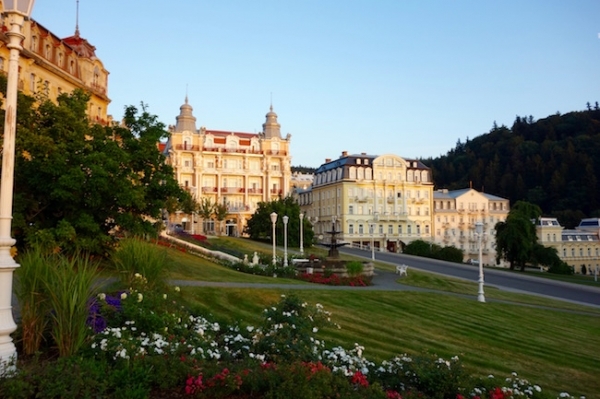 An easy way to spa in Marianske Lazne is to order a spa package through Danubius hotels. I’ll give you a sample of prices. You’ll find it’s much cheaper than doing an inclusive week’s spa package back in North America. A Comprehensive Spa Stay at Nove Lazne in high season (a minimum of 7 nights needs to be booked) includes accommodations, full board, doctor’s consultation (yes, spa doctors are real doctors) and 24 spa treatments per week in a Double Superior Room is 165 Euros per person per night based on 2 people sharing. Low season 138 Euros pp. If you’re not ready for quite the full experience, a Relaxing Spa Holiday Package might be just the way to go. This includes accommodation and half board, plus two spa treatments a day, and a doctor’s consultation. 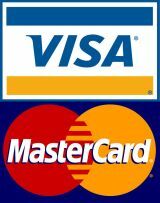 Total cost for a one week package in High Season is 994 Euros per person based on 2 people sharing. Low Season 805 Euros pp. If you’re really after just a sampler, that can be accommodated, too, from a 3-night Royal Spa Package (from 378 Euros pp inclusive), a Mini-Relax Package with the Roman Baths (from 238) or even just hotel accommodation with breakfast (from 86). While spa vacations in the Czech Republic are more affordable than in many countries there are a few ways to save even further. Stay more than 20 nights and save 5% – This may seem crazy long to you, but the best length for a spa cure is 3 weeks. Winter discounts, you can get a 10% discount on stays from Dec 1 to Dec 26, 2016. Opt for half board instead of full board. Stay at a 4-star instead of a 5-star and get similar privileges. 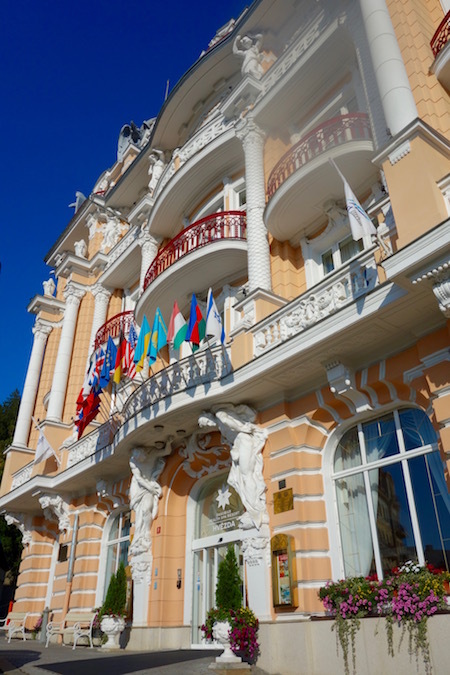 I’ve also stayed at the Hotel Hvezda, which is connected to the complex of 5 interlinked spa hotels in Marianske Lazne. Modern inside, it’s got one of the most eye-catching facades of any hotel in town. The 5 linked hotels are: 4-star superior Hotel Hvezda, 5-star Nove Lazne, 4-star superior Centralni Lazne, 4-star superior Maria Spa and the 4-star superior Imperial. 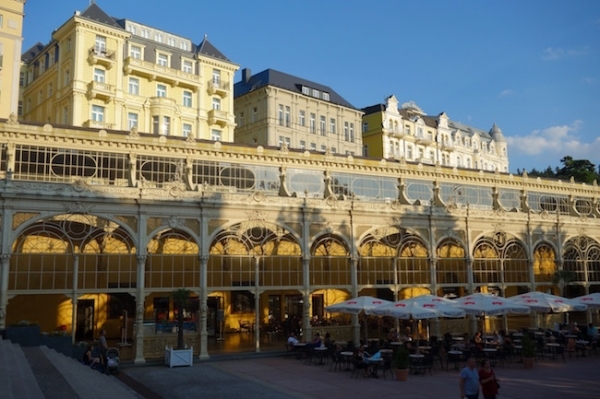 Resources for an easy way to spa in Marianske Lazne: To book spa packages, get hotel information and learn about the various spa cures in Marianske Lazne visit the Danubius website. The Czech Tourism Board has an excellent website with travel stories, travel guides and plenty of travel tips. In my 10+ years as a travel writer and columnist I've seen the best of what the world has to offer and written for some top publications around the globe - and now my goal is to bring this expertise to you. For more blah blah blah, visit my.